Our journey starts in Frankfurt where you will be handed the keys to the latest model 911 and faster than you can say “zero-to-sixty” your tour begins, experiencing the time of your life driving from one luxury hotel to the next, exploring exciting attractions along the way. Your route is pre-programmed into the on board navigation system, allowing you the freedom and flexibility to explore Germany, Austria and Switzerland at your own pace. Everyone will make their way to Frankfurt where they will be met and transferred to the elegant Hotel Nassauer Hof just 25 minutes from the airport. After check-in you can enjoy the many amenities offered by our hotel. At 3pm, the Porsche’s will be delivered to the hotel and we will start allocating the cars based on registration order. In the evening, we will enjoy a fun welcome dinner in a traditional German Hofbrauhaus where you can get to know your fellow travelling companions. Today we have a very exciting day planned. After breakfast we will make our way towards Stuttgart - Zuffenhausen. Upon arrival we will have a chance to visit the state of the art Porsche museum. Opened in 2009 it is one of the most spectacular building projects ever completed. Enjoy a close-up experience of the history of Porsche. Encounter legendary racing and sports cars, fascinating production models as well as unusual prototypes. More than 80 vehicles will take you from the early years all the way to the present days of Porsche’s history. After our visit to Porsche we will continue on into Austria and the incredible Interalpen Hotel. This is your last opportunity on the Autobahn before leaving Germany. After check-in take a walk around the hotel and make yourself familiar with all the fabulous amenities available to you. In the evening make your way to the winter garden where we will share our stories of the day along with a choice of six courses for dinner. An extensive salad buffet and a wide range of cheeses are included along with an amazing array of deserts for you to sample. Today after breakfast we leave Austria and head West towards Switzerland and the spectacular Chedi Andermatt Hotel. The hotel combines Swiss hospitality tradition with Asian elegance. It boasts more than 200 fireplaces, an indoor and outdoor pool, a 24-hour reception, and free Wi-Fi. The hotel also features a 2,400-square-metre wellness and spa area, comprising a fitness centre, a hot tub, a steam bath and a sauna. Tonight, we have an amazing BBQ planned on their outdoor terrace with views of the Swiss Alps. Today we have a spectacular drive planned on three of Switzerland’s most famous alpine passes including Susten, Grimsel and Furka. 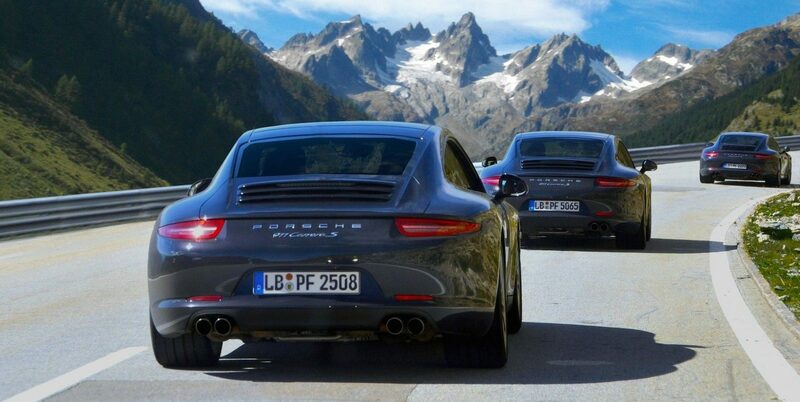 These mountain passes will really test the cars performance and your driving skills. Furka Pass was immortalized by the car chase in James Bond's Goldfinger, and is part of the "Big 3" Swiss passes. Forward visibility is fantastic and the road surface immaculate, so it's a road that you really can "drive" and really puts a big smile on your face. Tonight, we have another wonderful dinner planned at a local Swiss restaurant. Today is a free day to explore the surrounding area. Just a short walk from the hotel is the beautiful city of Gstaad. With its streets lined with exclusive shops, it’s a great way to spend the day. Or if you prefer relax at the hotel with a massage and a swim in the amazing pool with a view to die for. Tonight is a free night to dine at a restaurant of your choice. The concierge will be happy to help you make a reservation. Today after our amazing breakfast we head North towards Lucerne and the stunning Hotel Villa Honegg. Rising high on Mount Bürgenstock, this early 1900s villa offers luxurious rooms with balconies and a heated infinity pool with panoramic views overlooking Lake Lucerne. Facilities include a private movie theater and a spa center. The hotel was entirely renovated in 2011 and its air conditioned rooms are decorated with leather armchairs and relaxing beige colors. All rooms feature a Nespresso coffee machine and are equipped with free Wi-Fi, flat-screen TV and safes. Tonight, we will dine together overlooking the lake. This is an experience you will not forget. Today is your time to relax and enjoy the hotel. The main feature of the hotel is an outdoor pool with spectacular views of the lake and Alps. There are also hiking trails just outside the door should you want a more active relaxation. Footpaths and MTB trails lead through dense forest and across glorious flowering meadows or to the famous Cliff Path and Hammetschwand Lift. Today is a free day to explore the surrounding area. Just a short drive from the hotel is the beautiful city of Lucerne. With its streets lined with exclusive shops, it’s a great way to spend the day. Or if you prefer relax at the hotel with a massage and a swim in the amazing pool with a view to die for. Tonight we will enjoy a delicious BBQ on the terrace overlooking Lake Lucerne and the Alps. After our bountiful breakfast, we will leave Switzerland and head North towards Wiesbaden. After we check in at the Hotel Nassauer Hof we will say farewell to our Porsches’ as they will be picked up from the hotel. Tonight, we will gather in the grand ballroom to share our farewell dinner together as well as our memories of a lifetime. After your final European breakfast, you will be transferred back to the airport for your return flight home where life will never be the same. We had an amazing trip with Autobahn Adventures! This was a trip of a lifetime that we are planning on doing again! This was our first trip to Europe and we were incredibly impressed with the accommodations, location choices and activities that were planned. Being able to drive 911’s on the autobahn and experience everything that Europe has to offer was an amazing opportunity that we will never forget. Mark and Tina are fantastic hosts as well as friends and I would recommend this trip as the perfect way to experience the best of each country! Organized fun but not regimented at all! We’ve been with Autobahn Adventures for three trips. We try to go every other year. Every time we’ve gone, they’ve been a different route. What’s really attractive to us about the tour is that it’s not regimented. Yes it is organized, but you’re allowed and even encouraged to go wherever you want to go. The breakfasts and dinners are organized at the different hotels where you stay, but those are not mandatory either. In fact, just so you know how much we trust them, we signed up without even knowing where they’ll be going! We’re car #1 this time! This is our 2nd tour and it’s worth every single penny! We took a trip for the first time in 2007 and it was such a great experience! The second time around, they added Italy and Austria, so we decided this would be the best way to celebrate our 30th anniversary. The best things about the trip was the food and the people you get to meet. This organization is incredible and they can’t do enough for you! They are not regimented at all and you are not expected to join the caravan if you don’t want to, so you can meet up with the others later. Everything was included, so if you’re thinking about taking a trip, you really need to go! Enjoy a hand-picked selection of some of the finest hotels and resorts that Germany, Austria and Switzerland have to offer. Surrounded by the natural, year round beauty of the Swiss Alps, The Chedi Andermatt nestles elegantly among the ski chalets of Andermatt, a village of timeless charms in the Urseren Valley. The hotel offers 105 spacious guest rooms and suites. Traditional materials such as warm woods and natural stone create intimate yet visually striking accommodations while the extensive facilities include fine restaurants and cosy lounges, a ski-in living room with sports boutique. Guests can use the 2,400 square metre spa and wellness centre. Swim power laps in our temperature-controlled outdoor lap pool or cozy up with organic tea by our 35-metre indoor pool poised to look out upon the Alps. Keep your heart healthy with state-of-the-art Technogym fitness equipment and free weights. Take yoga classes and personal training sessions with our certified instructors. Warm up in our bio and Finnish saunas, or try an organic sol steam bath. This luxury 5-star hotel in Gstaad was opened in December 2012. It features an elegant, Alpine-Swiss design with natural materials such as marble, sand stone and old wood. The Alpina Gstaad offers 3 restaurants and a private cinema.vThe unique rooms and suites all feature a balcony with mountain views. The marble bathrooms include a flat-screen TV, luxury toiletries, slippers and bathrobes. Some suites also have a fireplace, and an iPad you can use during your stay. One of the restaurants, the Megu, offers an array of Japanese cuisine to try while you savour the views over the Bernese Alps. Relax in the wine bar or in the inspired Havana cigar lounge. The Six Senses Spa features holistic treatments, an indoor and an outdoor heated pool, a gym and a relaxation area. Additional complimentary amenities include wifi in the entire building as well as covered parking. The center of Gstaad is an easy 5 minute walk.